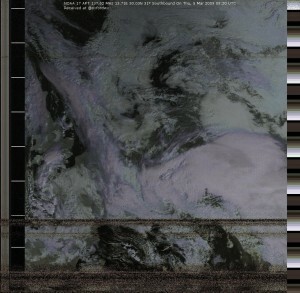 After about 3 years of not decoding APT weather satellite pictures, I decided 1 weeks ago to setup the Rig RIGSAT RX2 again and connected it up to the Diamond V2000, for the software I decided instead of using the Time-step software to use a free application called APT Decoder which can track, decode and process the satellite pass without any involvement from a human. Afterwards it has the ability to upload the decoded image and provides an RSS feed which can be subscribed to, which is handy as you can view the image on any type of device as long as you have Internet access. After a week and a half of decoding the results have been relativity good considering its not using a crossed or QFH style antenna, images do have noticeable noise on them but there still usable. and the software has performed without any issues.